California's "Three Feet for Safety Act"
Following the lead of many other states, California passed a law in 2014 (California Vehicle Code section 21760) which requires that drivers maintain a minimum 3-foot buffer when passing a bicyclist. However, there is some confusion about what this law does and does not cover, so our partners at the California Bicycle Coalition have provided answers to these frequently asked questions. Why do we need a law just about passing bicyclists? How will this law be enforced? What are the penalties for violating this law? How can drivers tell if they are giving a bicyclist three feet of clearance? How can drivers give bicyclists three feet of clearance on roads that are too narrow? Does the law apply when passing a bicyclist who is riding in a bike lane? Does this law prohibit a bicyclist from passing a car closely? What can I do to help get the word out about this law, and to learn more? A previous state law already required drivers to pass bicyclists at a “safe distance.” The problem is that there was no standard to let drivers know what is “safe” as the law didn’t specify a distance. Plenty of traffic laws reflect the fact that many road users — pedestrians, school children, emergency workers and road crews, for example — are especially vulnerable in the event of a collision with a passing motor vehicle. That is why drivers have special speed limits and special passing rules when approaching crosswalks, schools, school busses, emergency vehicles and road crews. By specifying three feet as the minimum passing distance this concept is simply extended to people on bicycles, who are just as vulnerable to motor vehicles. It will be enforced the same way California’s previous passing law was enforced: a driver who is observed to be violating the law can be cited. Many drivers will obey the law and some won’t – and won’t get caught. That is a problem with enforcement, not with the law itself (and yes, it also means drivers need to be educated about the law). This law will be particularly valuable where a violation results in a collision that injures a bicyclist, because it establishes a clear basis for citing the driver for unsafe passing. In far too many cases drivers who injure bicyclists never get cited or punished in any way, even when the injuries are severe or permanently disabling. This 3-feet minimum passing law will result in more careless drivers being punished and some of the worst offenders being taken off the road permanently. This protects everyone else on the road, including other drivers. For a violation that does not result in an injury, the law sets a base fine of $35, which becomes a $233 fine for the driver once court and administrative fees are added. For a violation that involves a collision that injures a bicyclist, the base fine is $220, which becomes a $959 fine for the driver. This penalty is equal to the lowest fine imposed for reckless driving with bodily injury. We recommend “if you don’t know for sure then you are probably too close” as the rule of thumb. Keep in mind that the law requires a MINIMUM three foot passing buffer, but when traveling at speeds above 25 mph, when operating a large vehicle, or when on a multi-lane street we recommend giving more than three feet, or simply changing lanes completely to pass. Will the law apply when passing a bicyclist who is riding in a bike lane? We were originally told that it does not, but upon closer examination there is some grey area in how the law was worded which will probably not be worked out until a case goes to court and a judge rules on it. However, there is no language in the law which specifically says that bike lanes are not covered, so for now we are advising drivers to always pass bicyclists with at least a 3 feet buffer in every situation. The actual text of the law can be found online here. Will this law prohibit a bicyclist from passing a car closely? No. The law applies specifically to motor vehicles passing bicyclists from behind. A bicyclist who passes a motor vehicle by less than three feet — for example, when pulling alongside a car stopped at a red light — would not be in violation (and wouldn’t cause the driver to be in violation either, as the bicyclist is passing the driver and not the other way around). 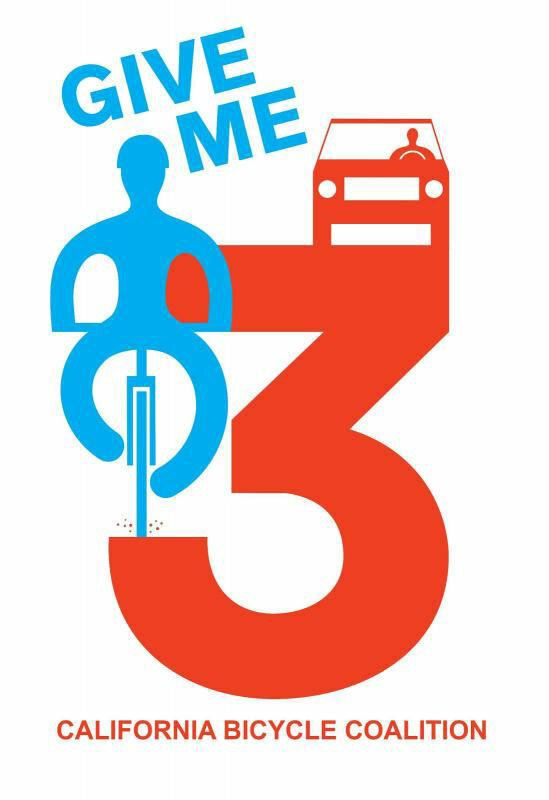 The statewide California Bicycle Coalition is working hard to educate all road users about this law, and you can support them by ordering and distributing your own “I Give 3 Feet” stickers and window clings. Go to CalBike.org/3FootEducation to read about their campaign and place an order. Bike East Bay will also be doing outreach and answering questions about the law as part of our free Urban Cycling 101 classes hosted all over the East Bay. Go to BikeEastBay.org/education for our full class schedule and sign up for a session today!